In the current market, it takes a heck of lot more than simply hanging a For Sale sign from the lifelines to sell a pre-owned boat. So I went to those who know—certified yacht brokers—to learn some of the tricks of the trade. My broker brain trust—Peter Galvin of Eastern Yacht Sales, Bob Reed of Bob Reed’s St. Clair Sailboat Center, Ed Kurowski of Gratitude Yachting, and Bump Wilcox of New Wave Yachts—made these suggestions. Clean everything—bilge, sole, upholstery, cabinets, lockers, the shore-power cord, and under the sink in the head. Everything. If your boat is spotless, the buyer will think you’re detail oriented and that all the systems have been well maintained. If the boat is a mess, a prospective buyer might think you also neglected to change the oil in the engine. Remember the last time you went to the boat show? Make your boat look like it’s in a new-boat show. 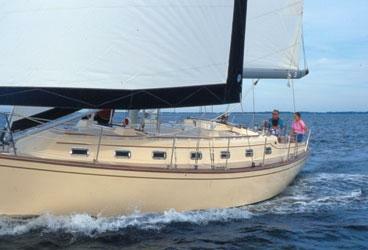 Make sure all the cushions are in place and periodically open all the ports and hatches. It’s got to be “fresh” belowdecks. Remember, you only get one shot at making a first impression, and musty-smelling accommodations aren’t the impression you want to make. 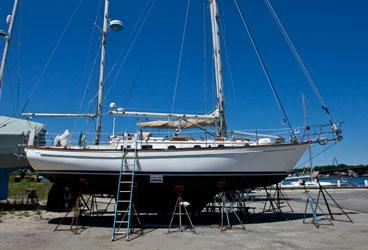 A strong Internet presentation is critical, so make sure your boat is as enticing as possible to those online shoppers. 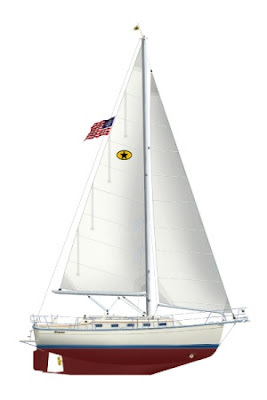 You should provide a complete history of the boat and its upgrades; a detailed inventory of everything, including sails, electronics, and major systems; and photos that allow Internet tire kickers/prospective buyers to enjoy a photographic walkthrough of the entire boat. It’s a good idea to get the boat surveyed so you can learn about and fix any potential problems before the boat goes on the market. If the bottom or the topsides need a paint job, do it. If you’re painting the hull, use only white or dark-blue paint. However, one broker recommends not spending money on electronic upgrades. You’ll only get a small part of that investment back. If you want to sell your boat in this market, you’ve got to get in, get aggressive, and get out. That means you may have to price it below the lowest priced comparable boat on the market (by at least 5 percent), even if your boat has better equipment, fewer engine hours, and the like. A quick sale means less pain. Once you’re no longer the seller, you can take advantage of the situation in reverse. Selling a used boat can be a full-time job. If you plan to do it yourself, be prepared for appointment no-shows and comments such as “It’s exactly what I want, but next year” or “It’s exactly what I want, but I’d offer half the price.” When talking to prospective buyers, listen equally to both the husband and the wife, and always respond to their questions honestly. If you’re not up to the challenge, hiring a certified yacht broker could make the whole process a bit easier. Then you can focus on the fun things, like shopping for that new boat you’ve always wanted.